I don’t know about you, but I love to send and receive letters. During middle school I had pen pals in Turkey, Germany and Japan. Whenever I would visit my grandmother in Nevada, I wrote my best friend every other day. I’ve gotten out of the letter writing habit. I don’t even really send emails. Isn’t it nice to get something in the mail that tells you someone was thinking of you? 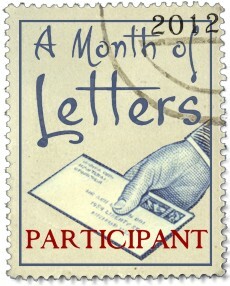 When Beth and Rhonda both mentioned the A Month of Letters Challenge on Twitter I was immediately intrigued. And it’s only tonight, just a few days before it starts, that I’ve decided to participate. If you want me to send you a letter and I don’t have your snail mail address, just leave a comment and I’ll email you or send you a message. Mirrored from Amber Stults - Book Reviewer and Writer.